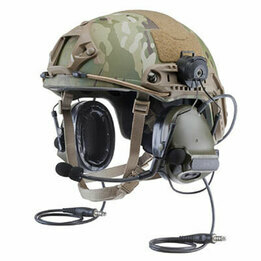 ComTac electronic tactical ear muffs were created for the most demanding military communications challenges. Now available in third and fourth generation models, ComTac headsets are available to military, police, and civilian shooting enthusiasts as well. ComTac headsets are sold in kits that include the headset, a PTT adapter cable, upgraded gel ear seals and a carry/storage bag. The kits, orderable below, are available in five different configurations: Three dual comm set ups for military radios, one single comm setup for military radios and one single comm setup for selected Motorola radios. The kits limit the color choices and offer support for a limited number of radio models, but can save you money it one of the kits will work with your radios. For those who choose not to buy a kit, ComTac III headsets are available in three models: Dual Comm with two downleads, each able to connect to a separate radio, Dual Comm with one downlead that plugs into a special split wire PTT adapter which then can be plugged into two radios, and a single comm model. These headsets will work with virtually any radio, provided you choose the correct PTT adapter cable. 3M Peltor ComTac, SwatTac, MT Series and other model two-way radio headsets are generally equipped with a fixed downlead (or two), terminated with a male TP-120 plug that mates with a push-to-talk (PTT) inline adapter cable. Each PTT cable is terminated on the other end with the connector required to plug into one of the many different two-way radios currently on the market. Visit this page to find the PTT cable you will need for your radio.